Newman Consulting Group, and Jim Newman personally, have been recognized for excellence by many industry organizations and professional publications. In March 2019, Jim Newman received the ESD Affiliate Council’s Ann O. Fletcher Distinguished Service Award for 2018. The recognition honors individuals for their dedicated service. The award was first awarded in 1997 in Ann O. Fletcher’s name to honor her lifetime contribution to The Engineering Society of Detroit. The Affiliate Council consists of professionals representing 100+ ESD Affiliated Technical Societies. In June, 2018, Jim Newman received ESD's TechCentury Image Award, presented annually to individuals who have helped promote the engineering and technical professions through community, educational, professional and social media involvement. In December, 2017, NCG was commended for work on preserving The Whitney Restaurant using PACE (Property Assessed Clean Energy) to finance new building energy systems. The Exemplary Project Award, presented annually by the GLREA, recognizes the renewable energy or energy efficiency project that demonstrates the most innovative and practical use of technologies and methods for creating or conserving energy. In February, 2017, Jim Newman was recognized by ASSE (American Society of Sanitary Engineering) with the John E. Matthews Award for Engineer of the Year, which is given annually to an engineer who best exemplifies the professionalism during his or her career as displayed by ASSE member and leader John Matthews, PE, CIPE, FASSE. In September, 2015, Jim Newman was named an EcoWorks Sustainable Communities Champion. Newman, along with two other Michiganders and a local organization, were recognized at the EcoWorks annual breakfast for demonstrating a deep commitment to modeling sustainable solutions, and perhaps more importantly, encouraging others to adopt sustainable practices as well. Former Michigan Governor, Jennifer Granholm, was the keynote speaker at the annual event. 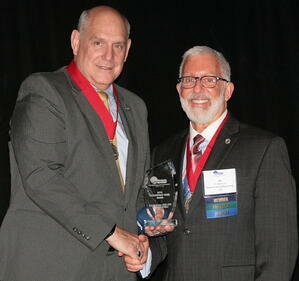 In October, 2012, Jim Newman was named an Association of Energy Engineers "Legend in Energy." This mark of distinction is bestowed to qualified professionals who meet certain criteria of recognition or service to the organization. In June, 2012, Jim Newman received the Distinguished Service Award from ASHRAE at the 2012 Annual Conference held in San Antonio, TX. The Distinguished Service Award recognizes members for giving their time and talent on behalf of the Society. A Life Member, Newman is an ASHRAE-Certified Operations and Performance Management and Building Energy Assessment Professional, and also serves as an ASHRAE Distinguished Lecturer. He is a past member of the ASHRAE Detroit Chapter Board of Governors, and has served on various international technical and policy committees. Since 2002, he has been a certified trainer on ASHRAE/ANSI/IESNA Energy Standard 90.1, and has trained hundreds of architects, engineers and facility managers on the Standard. In February, 2010, ASHRAE selected Jim Newman as an ASHRAE Distinguished Lecturer effective July 1. The ASHRAE Distinguished Lecturer program provides ASHRAE chapters, student branches, and other organizations with lecturers equipped to speak on relevant subjects of interest to ASHRAE members and guests. Some of Mr. Newman’s topics include: LEED and Integrated Design; Tax Deductions from the Energy Policy Act of 2005; Transforming an Older Building into a High-Performance Facility, to name only a few. To see a partial list of topics please visit the ASHRAE website. For further topics, see Speaking Engagements. In March, 2010, the Engineering Society of Detroit (ESD), its Board of Directors, and Executive Committee of the College of Fellows, nominated Jim Newman as a member of the ESD College of Fellows. ESD Fellows are members of unusual distinction, conferred by invitation of the Board of Directors for outstanding and extraordinary qualifications and experience in their professions as evidenced by accomplishments in the following major areas: technical achievement; professional achievement; ESD service and leadership; and professional society service and leadership – as indicated by honors and awards, publications and patents, academic service and leadership, and community service and leadership. In February, 2010, Jim Newman was nominated along with 350 other individuals, businesses and non-profits for the prestigious ‘Michigan Green Leader’ award. Out of 350 nominations, 16 companies or individuals were awarded the ‘Michigan Green Leader Award’ and fourteen others, including Jim Newman, received ‘Honorable Mention.’ The judges of the event stated that the additional winners were selected because they were deemed as individuals/companies that showed significant merit in the field of innovation, job creation, products and services, sustainable development, community advocacy, conservation and much more.